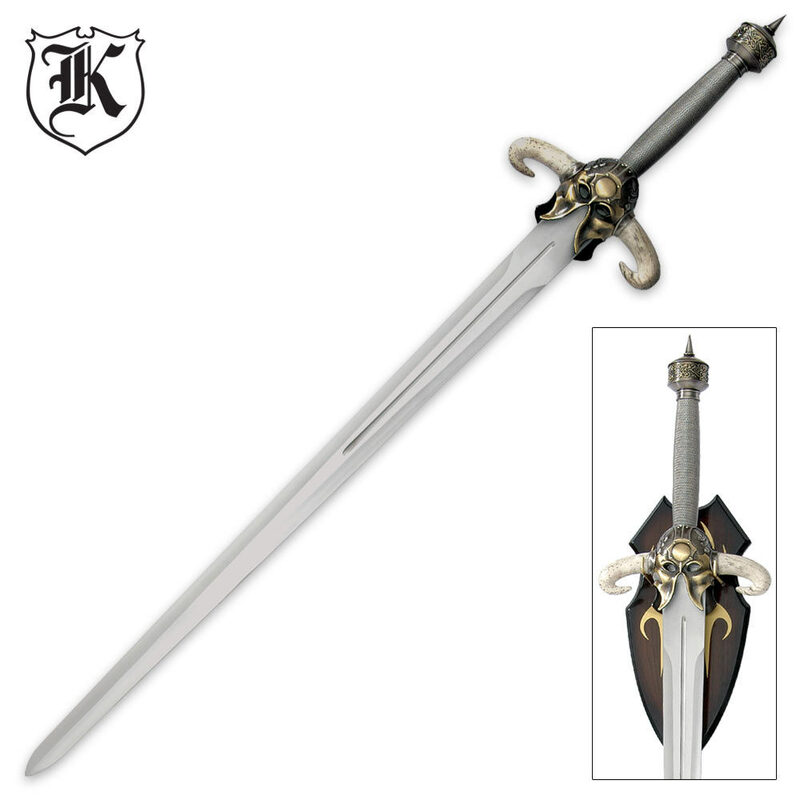 Historic Collectible Barbarian Warrior Sword With Display Plaque | BUDK.com - Knives & Swords At The Lowest Prices! It's time for another addition to your historic sword collection! This top-quality collectible Barbarian Warrior Sword features a heavy 33" satin-finished stainless steel blade with a blood groove. The exquisite guard features a Barbarian war helmet design complete with faux ivory horns, met by a heavy wire-wrapped handle with a spiked pommel. 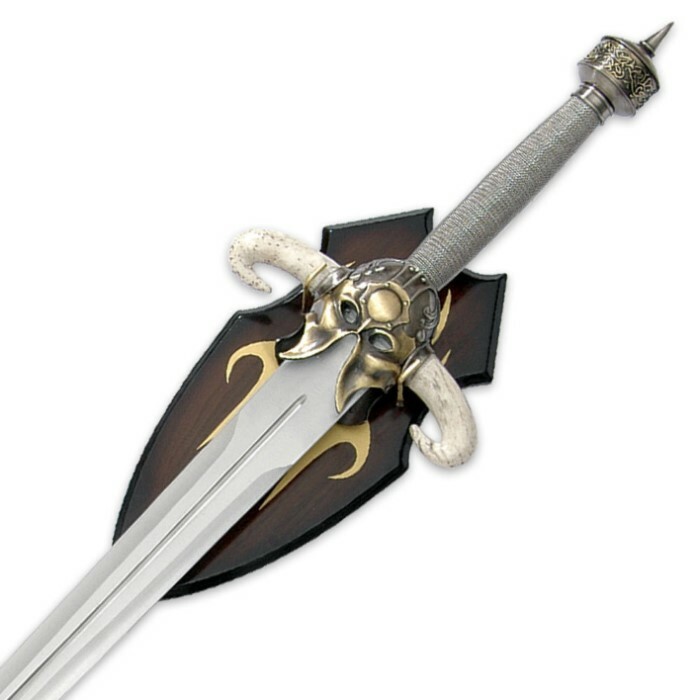 The attention to detail is unsurpassed in this Barbarian collectible sword. Display it in style with the included fantasy wall plaque. My wife and I love this sword. It will hang next to my kit Rae. Yes, its nice enough to hang with my Kit Rae swords. The helmet, bones and pommel look really nice together. Note, this is a display sword. No sharp edges and fixed blade. The wooden display is also nice, but I would change the mounting hardware due to the weight of this sword (but thats me. I dont trust a slotted flathead screw hole on pressed wood. Might brake away! That could really due some damage). I will more-than-likely make my own wooden display with hand carvings on it. But don't let this discourage you. It's the sword you really want. You can just drill thru the face behind where the handle will hang and fasten it with a longer screw. 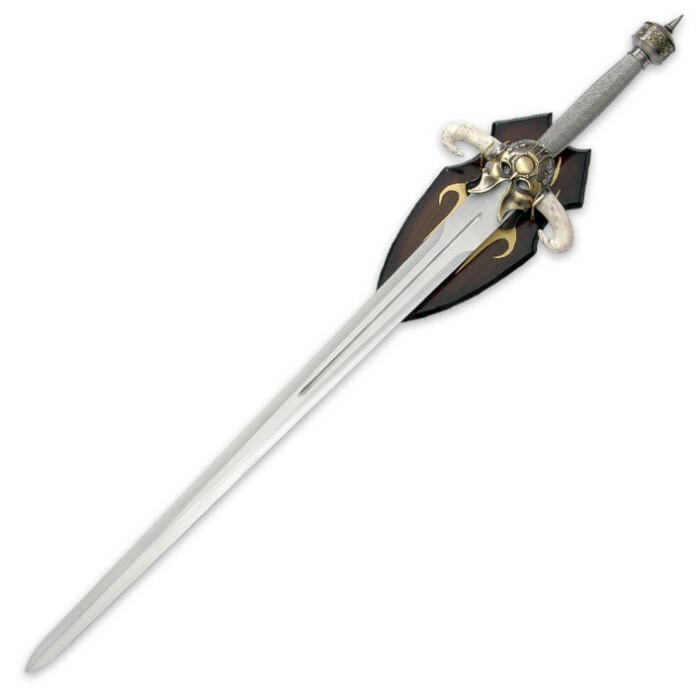 I would recommend this to anyone who wants a really nice display sword. For 30$ you wont be disappointed. ..Hs.. Sword was exactly as described! This was my first purchase from True Swords...and there will be many more. Their prices are amazing. This was not only my first two handed long sword but my first buy from true swords all together. it looks great but im quite dissapointed in the blade. it is not sharp what so ever, in fact the edge is about 1mm thick. it is poorly balanced, front being alooot heavier then the rest of the sword. the blade is a little shaky at the handle. also the steel is quite flimsy. when the sword arrived the point at the back had been smushed in, most likely from the transportation. if buyin this merely as a display id say go for it but other then that id choose a different one.